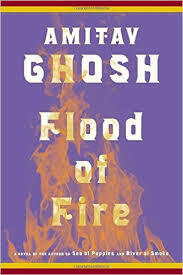 This is the third and final volume of Ghosh’s excellent Ibis Trilogy. It’s been awhile so in the first couple chapters I had a lot of catching up to do. I barely remembered who Zachary Reid, a bi-racial American sailor, was -much less the other characters, Bahram Modi. These folks were important in the prior novels – in Sea of Poppies (no blog entry here), the first one, for sure and I think River of Smoke, too (huge blog entry). But I guess Ghosh must have anticipated this because the first chapter gives us some catch-up time with the addition of another character, Havildar Kesri Singh is a soldier who enjoys his job stationed with the East India Company in Assam, northeastern India. He is the brother of Deeti from Sea of Poppies, the first volume. I had to get some help remembering the first two books: https://en.wikipedia.org/wiki/Sea_of_Poppies and https://en.wikipedia.org/wiki/River_of_Smoke . At the start of Flood of Fire Bahram is dead and his widow, Shireen, is left to deal with his money troubles in Calcutta while Zachary is living in a boat on the river outside the Burnham house remembering Paulette. Neel, the bankrupt Indian raja, is stuck in Canton, and Kesri (brother of Deeji, is farming and waiting to find some way to join the military.